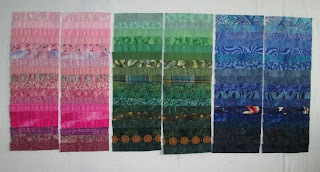 This week I worked on more teal scraps. 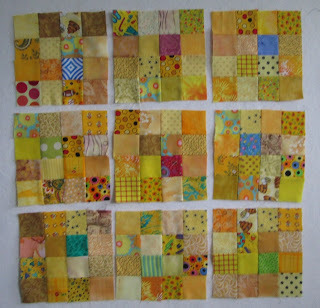 I got 9 blocks done using 2" scraps. I love this colour. 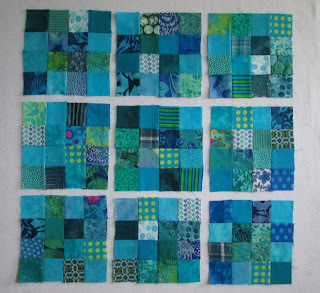 I added this to Soscrappy's Linky Party. I also did the blue 16 patch blocks I missed in May. 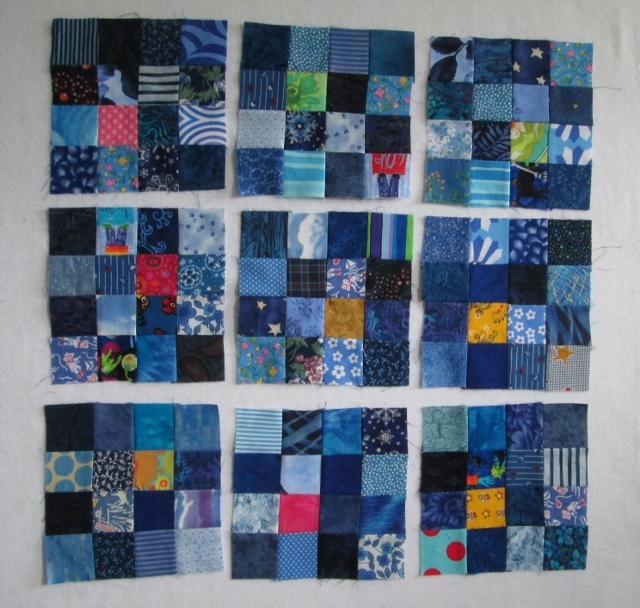 I had the 2" squares cut but did not find the time in May to sew them together. 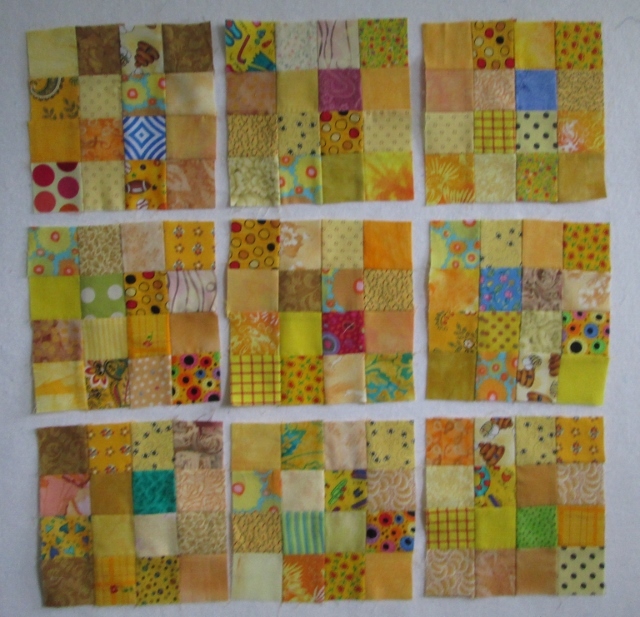 Also got June's yellow 16 patches done. 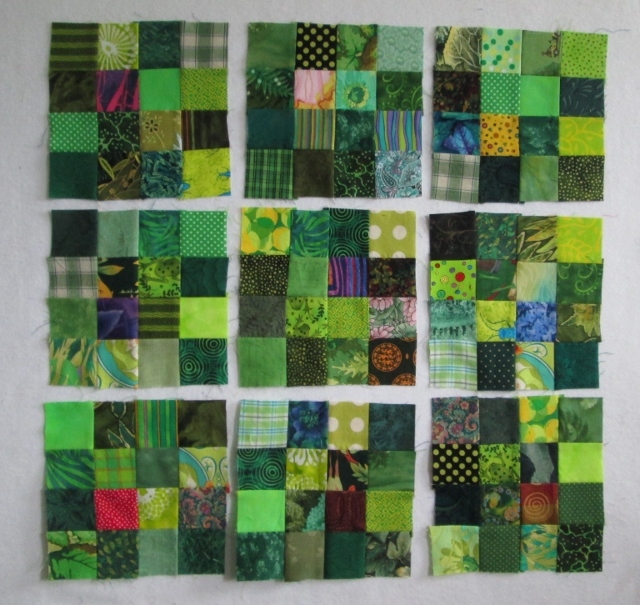 I then worked on the April's Green 16 patches too. I then worked on catching up on the coin strips too. Pink from January, Green from April and Blue from May. 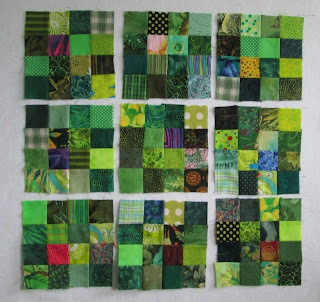 I think coin strips and 16 patch blocks are all caught up now. Today I hope to work on some more teal. These bits are to be butterflies. I need to do a little more teal still. I just love this colour! 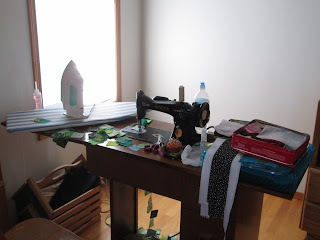 This week I got more done because I was sewing up stairs in front of the TV in the evening. I got out this old machine I bought last year. I finished cleaning and oiling. I had it just dripping in oil. It needed it. It is a 1948 gear driven singer in a cabinet. It was the first time I have sewn with it and I am very happy with it. I spent the week watching Downton Abby season 1. I love the third show. English Fox hunting and good looking men. I may have to watch that one again. I made Coconut, Poppy seed, Lemon muffins today. I found them on Pinterest and have now made them 3 times. 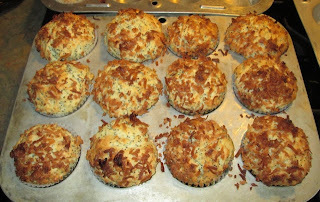 I added the toasted sweet coconut flacks on top. Here is the link. Let me know if you try them. I love them. You really got caught up with your blocks this week...way to go! All your scrappy work is fantastic! Your blocks look fantastic. As do your muffins. I could quite easily eat one of them. And as for downton abbey. I love it! 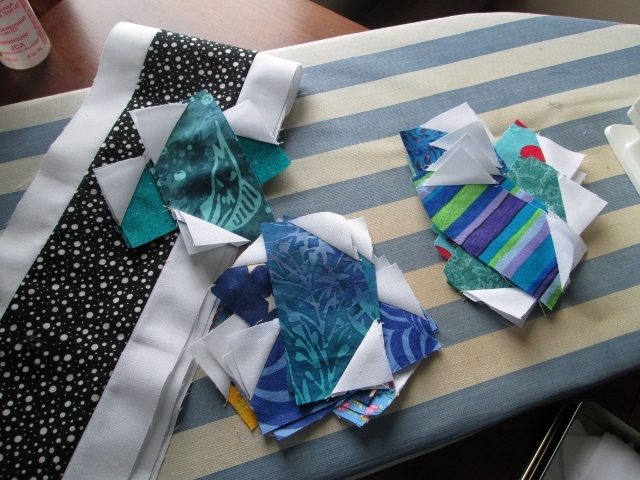 Yummy scraps - I think 16 patches may be one of my favorite blocks! Yay for vintage sewing machines. Yours looks like a Model 15. I have three of them, 2 treadles and one electric. They're wonderful! Going to look at the muffin recipe right now. Yours look delicious! Love all the colored squares! Hi, Cathy. 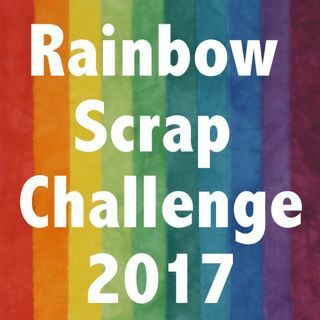 I like how you've mixed different colors into your scrap blocks, which makes the main color dance. 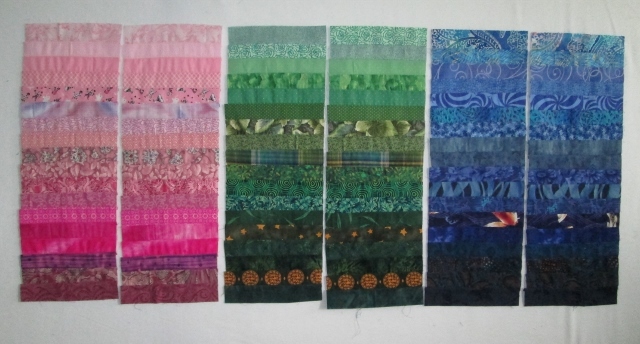 The coin strips are going to be beautiful, too. I'm rather envious of that old machine that you've gotten up and working!